As part of our ongoing commitment to Help Keep Kids Safe and give back to the community, Montlick & Associates is proud to sponsor the Lifeprint Next Generation Child Safety Event. 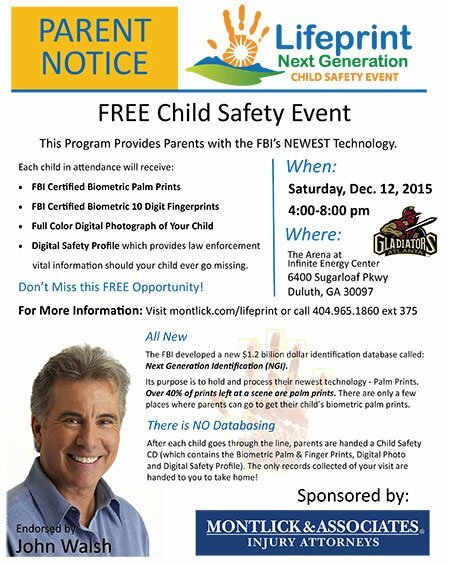 This is a FREE Child Safety Event that provides parents with the vital tools needed to help protect their children. Time is critical in the recovery of a missing child. 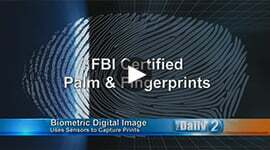 If a child becomes missing, parents greatly increase their chance of quickly recovering their child if they immediately provide Law Enforcement with an FBI-Certified Biometric 10 Digit Fingerprint and Palm Print Profile, and a High Resolution Full Color Photograph. FREE Child Safety Journal which will provide law enforcement officials with all the necessary vital information about your child and other important facts they will need immediately after a child is reported missing. Parents, Please Bring Your Children to Next Free Safety Event! Up to 500 children can participate, so get there early to insure your spot. Note: Your child's data and fingerprints are not collected or saved by Lifeprint Next Generation or Montlick & Associates. After each child goes through the line, parents are handed a child Safety CD (which contains the Biometric Palm & Finger Prints, Digital Photo and Digital Safety Profile). The only records collected of your visit are handed to you to take home! Safe Kids Cobb County will partner with Cobb County Safety Village to hosts its annual fall festival. This festival is held every year as an alternative activity for families to participate in instead of trick-or-treating. Since Halloween is one of the most dangerous nights of the year marking an increase in pedestrian incidents, Safe Kids and the Safety Village will host this event in an effort to get kids off the streets. Safe Kids Georgia is dedicated solely to preventing unintentional childhood injury. The focus is on one specific problem: more children 1 to 14 die from accidents such as motor vehicle crashes, fires, drowning, poisoning and falls than any other cause. HelpKeepKidsSafe.org has tons of information to help you become more knowledgeable about safety and prevent injuries to children. Have fun exploring! Montlick & Associates hopes that you and your family will always be safe! Montlick & Associates, Georgia Accident Attorneys, is dedicated to helping injured people receive the compensation they deserve. Our team of professionals is committed to providing exceptional service with personal attention.